A newsletter reader sent us a message asking if we would write something about appropriated art. The topic of cultural appropriation is increasingly making headlines, and 2017 so far has been rife with controversies. In one aspect, the fact that there is such a concentrated discussion in mainstream and social media is, I think, the silver lining to this particular cloud. The other view of the cloud is how troubling it is that this affront to Indigenous culture is ongoing despite the coverage in mainstream media. 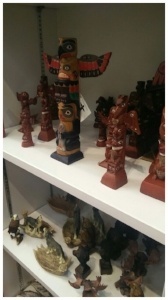 The picture above was taken in a store in downtown Victoria on a street populated with stores that cater to tourists. Every store we entered had the same, or similar, items for sale and every store we entered was bursting with tourists from Asia and Europe. It was disheartening to think that these knock off items were going out into the world as representatives of Indigenous art from Canada. Indigenous art has been coveted ever since European contact with Indigenous Peoples, when explorers were instructed to collect "exotic curiosities" such as ceremonial regalia, clothing and tools. That desire to possess a piece of ‘wild’ or ‘exotic’ art unfortunately led to the manipulation of situations or outright pillage from communities, sometimes when they were at their most vulnerable, struggling with epidemics, famine or poverty. Some villages that were empty because of disease or forced relocation were looted. The Indian Act made potlatches illegal (1880 - 1951) but some potlatch families defied the law and were subjected to raids, imprisonment, and confiscation of masks and regalia, which were often sold to collectors and/or sold and donated to museums. Today, the copying or theft of Indigenous art is less dramatic but more pervasive. Sales of knockoff items created in Canada, and offshore, are rampant across the country. These knockoffs devalue the history of the culture that is infused in authentic Indigenous art, and perpetuates the demoralization of Indigenous Peoples. Knockoff items also harm the Indigenous artist community, devalue Indigenous art in general, and send the wrong message/image of the quality of Indigenous art out into the world. Art is the conduit that keeps a culture strong, it connects the present with the past, it is an important aspect of identity. It is also an important source of income for communities where economic opportunities can be limited. As the older Indigenous population ages and passes on, as economic pressures force more Indigenous people to relocate in urban centres, there is a great responsibility for communities to ensure their culture and art is protected and kept alive by the younger generations. The third tier is for situations in which an artist has granted permission for a producer to use their design to create, distribute, and sell the product. A benefit beyond the artists receiving a royalty is that the system encourages consumers to contact registered artists directly, it encourages consumers to do their due diligence, it encourages consumers to learn about the artists, their culture, and the influences that shape their unique art. So, what can you do to ensure you are buying authentic Indigenous art? If you are buying from a gallery, talk to the owner/staff about the piece you are interested in. Ask about the artist, their community, their other work. If answers to your questions are vague then that could be a sign that the item is not art but a knockoff. Many artists have websites so you can contact them directly. If you are in a store that sells kitsch then it’s unlikely that the items are authentic. Incidentally, in 2012, the Cowichan sweater was officially recognized as an object of national historic significance by the Federal Government. Long before then, in 1959, Indian and Northern Affairs Canada, in an attempt to distinguish Inuit art from imposters, created the “igloo tag” which is available only to Inuit artists. Here's a free ebook that takes a look at nine common myths and provides the realities. Click the image to grab your copy. Check out our Training Weeks. Four great courses - something for everyone.